Having finally gotten into the Pottermore Beta testing, I have been sorted by JK Rowling herself, and have been put into House Hufflepuff. This was a big shock, as I had always assumed I was Ravenclaw. It’s not that I think I’m particularly smart, or had any emotional attachment to that house, it’s just that whenever I ordered something in Slytherin colors for my Bellatrix Black school uniform, I was ALWAYS mistakenly sent Ravenclaw colors instead! Seriously, this happened over and over, with my sweater, my scarf…whatever I ordered. I just took it as a sign: I was Ravenclaw. 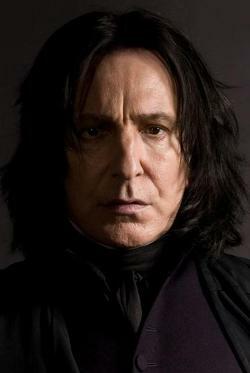 Despite this, I always did cosplay as Slytherin, not because I value ambition or sneakiness, but because I love Snape. Completely, totally adore him. So secretly (or not so secretly) I was hoping to be sorted into Slytherin. I didn’t really expect it to happen though, because I don’t share Slytherin’s “values” in my real life, and….darn it!….the universe had already proclaimed me Ravenclaw! But Rowling believes me to be Hufflepuff. Okay, fine. I wasn’t *thrilled*, but…okay. And then I did some research (guided by Pottermore’s new revelations from Rowling) and discovered something really interesting. Everything I value in real life, the way I really believe and think…is reflected by Hufflepuff. For instance, there’s this article: Are Hufflepuffs Duffers? For my own views, I’ve never quite liked Rowling’s definition of bravery, or her insistence that it is the most important of all virtues. Gryffindor’s bravery is fine and good – and needed – but the sort of “bravery” her heroes demonstrate is most often pure stubborn recklessness and disregard for the rules. What is brave about charging forward regardless of the odds? So often in Rowling’s world there would have been a much better way of handling the problem, and yet her heroes are always rewarded for their “bravery” instead of disciplined. One example is in Goblet of Fire. Harry Potter has to pass an underwater test and “save” his friends. He made the unfounded and reckless assumption that his friends are actually in danger and blows the test by rushing headlong into the situation. He does “save” them, yes, but they weren’t actually in danger, and if he’d taken a bit of time to think, he’d have realized that. He always rushes in, on his own – or with his friends, thus endangering them – when he might have asked for help and thus resolved the situation much more easily. This is not my definition of true bravery. This is my definition of reckless arrogance. Since this their defining characteristic, I am not a Gryffindor. Ravenclaw is a little too obsessed with intelligence. The smartest people are not always the best people, and I have a real distaste for those who look down at people because they don’t possess the same skills or abilities as themselves. Granted there are great people in Ravenclaw (I love Luna, for example) but there is no way I can put “book learning” over emotional well-being. I am not a Ravenclaw. Hufflepuff is the most inclusive among the four houses, valuing hard work, patience, loyalty, and fair play rather than a particular aptitude in its members. Students belonging to this house are known to be hard-working, friendly, loyal, and rather impartial. It may be that due to their values, Hufflepuffs are not as competitive as the other houses, or are more modest about their accomplishments. Hufflepuff appears to have the least rivalry with the other houses. Ambition, bravery, and intelligence matter not a whit if you aren’t in your core a happy person, a good person, a fair person, and a hard-working, loyal person. People get so wound up sometimes in wanting to be great, that they forget how important it is to be nice. Hufflepuff’s virtues are old-fashioned virtues, which is why they are mocked for being ‘duffers’, but these are values that people everywhere need to hold onto. The Hufflepuff common room is entered from the same corridor as the Hogwarts kitchens. Proceeding past the large still life that forms the entrance to the latter, a pile of large barrels is to be found stacked in a shadowy stone recess on the right-hand side of the corridor. The barrel two from the bottom, middle of the second row, will open if tapped in the rhythm of ‘Helga Hufflepuff’. * As a security device to repel non-Hufflepuffs, tapping on the wrong barrel, or tapping the incorrect number of times, results in one of the other lids bursting off and drenching the interloper in vinegar. A sloping, earthy passage inside the barrel travels upwards a little way until a cosy, round, low-ceilinged room is revealed, reminiscent of a badger’s set. The room is decorated in the cheerful, bee-like colours of yellow and black, emphasised by the use of highly polished, honey-coloured wood for the tables and the round doors which lead to the boys’ and girls’ dormitories (furnished with comfortable wooden bedsteads, all covered in patchwork quilts). A colourful profusion of plants and flowers seem to relish the atmosphere of the Hufflepuff common room: various cactii stand on wooden circular shelves (curved to fit the walls), many of them waving and dancing at passers-by, while copper-bottomed plant holders dangling amid the ceiling cause tendrils of ferns and ivies to brush your hair as you pass under them. A portrait over the wooden mantelpiece (carved all over with decorative dancing badgers) shows Helga Hufflepuff, one of the four founders of Hogwarts School, toasting her students with a tiny, two-handled golden cup. Small, round windows just level with the ground at the foot of the castle show a pleasant view of rippling grass and dandelions, and, occasionally, passing feet. These low windows notwithstanding, the room feels perennially sunny. 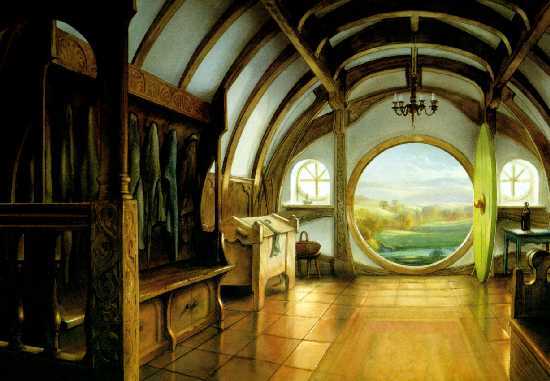 Doesn’t this sound like a hobbit hole…my formerly favorite place in all of fiction? Views of dandelion lawns! I love dandelions – I refuse to dig mine out of my yard, and every time I pass by an overgrown field I sigh at the beauty of those bright golden heads. And, right now, my real life studio is painted yellow. Everything in that description feels like home to me. I have always felt very strongly connected to gardening, to the earth, and Hufflepuff is the house associated to earth. Also, the badger is our animal, and badgers are awesome. There is a lot of meaning behind the badger being chosen as our mascot. Badgers are calm…except when they or their family are attacked. Then they turn into one of the most terrifying creatures on earth, well capable of fighting off a lion. Check out this video of a Honey Badger if you don’t believe me! And to crown it all off, there are some really cool people in Hufflepuff, Tonks and Rowling herself being two of them. So NOW I’m actually really excited about being chosen a Hufflepuff, and while I don’t understand Rowling’s system for sorting, I think it works. The only thing about Hufflepuff I don’t like is the Robert Pattison connection, and that isn’t Rowlings’ or Hufflepuff’s fault. This entry was posted in Uncategorized and tagged core beliefs, harry potter, hufflepuff, pottermore, rowling, values. Bookmark the permalink. Hufflepuff is great! 😀 I’m almost certain that’s the house I’ll be sorted into, but still don’t have access to the site for the test. I found that video when I was doing my Puff research, and it gave me a good laugh. You might be surprised what house you end up in though – so far everyone I know has been completely surprised by their results! 🙂 Good luck! hufflepuff is awesome. Its my 2nd house choice. 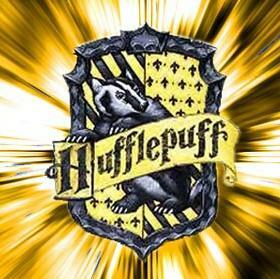 I like hufflepuff they are my second choice after gryffindor!!!! I also had this experience! I always felt like a Gryffindor. Then I made the test and became Hufflepuff, totally chocked and dissapointed. I deleted the account, opened a new one and made a new test, became freakin Hufflepuff again! Then I started to read about them and realized I might be a Hufflepuff afterall, seams like the only genuine house with depth, although I love Gryffindor charachters! Who doesn’t lol. Their common room really sounds amazing, and I like the yellow light that shows up in my head when I think Hufflepuff. Family and inner circle oriented in a way. That’s what I didn’t like about the Hufflepuffs to begin with, they always seemed to be by themselves, only showing the good and nice side to everyone else. There seems to be something more mysterious and serious about Gryffindor, and Slytherin. A mystery that feels honest and safe in Gryffindor. I will forever love and feel like a Gryffindor, but I totally accept pottermore’s choice for me as a Hufflepuff! I liked the questionary. I’m so glad that JKR showed us more about the hufflepuffs! Lovely article! I struggled with being placed in Hufflepuff too, but like you I have to admit to valuing their traits the most!